An example of moss building up. you can climb up there and take a look. With the amount of rain fall we have in England moss is growing more quickly than ever before. 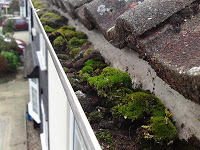 After the big freeze we have in January & February the moss falls from the roof and lands into the gutters. 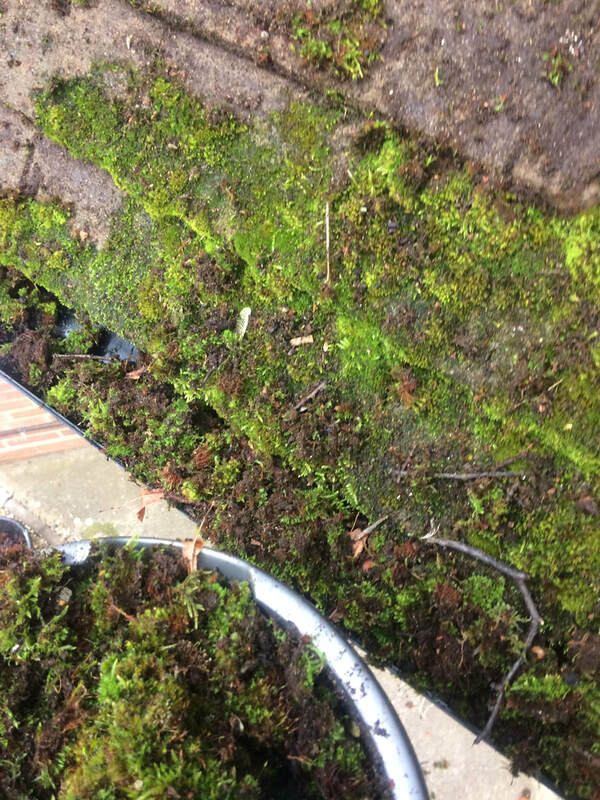 Moss likes to soak up water and rain water is soaked up and does not run correctly to the down pipes. Moss is one of the number one factors for clogging up your guttering. It does not matter if you are in a area without trees, moss grows when we have heavy rain. Dampness = Moss. 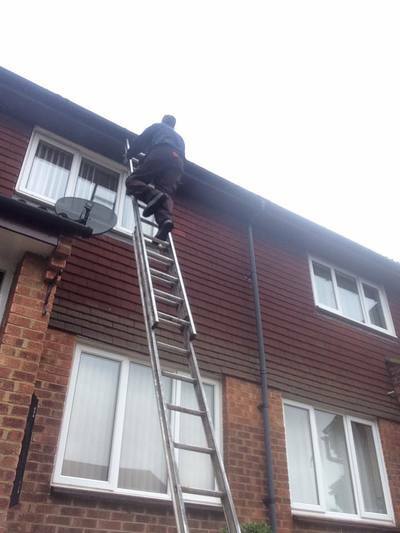 Our gutter cleaning service is rated one of the best value for money services in Hertfordshire. Our rates are low but our service is second to none. 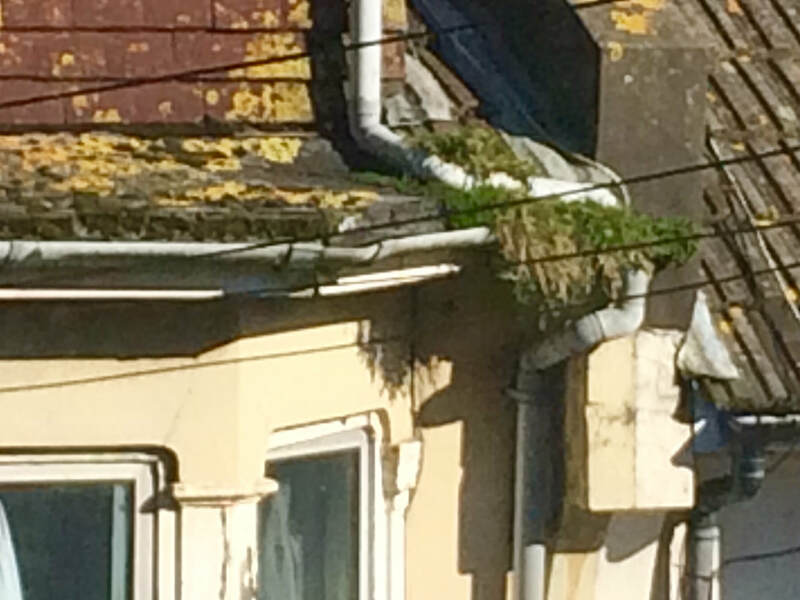 Firstly We clear all the guttering on your property. This includes any extensions, garages, conservatories. We then repair any damaged or broken sections of guttering. This includes installing downspouts that may have come adrift from the wall. After these two steps We then concentrate on the rubber seals on each Double Bracket. If the seal is perished We’ll replace it. Finally We’ll wash the gutters through making sure the water channels correctly with no drips or overflows. Neglected Guttering can eventually lead to more serious problems. Rotten fascia's, roof beams. High costs to correct the damage. Hertford | Stevenage | Welwyn Garden City | Welwyn | Knebworth | Datchworth | Panshanger | Tewin | Tring | Hatfield | Bassingbourne | Biggleswade | Ware | Letchworth Garden City | Hitchin | Aston | St. Albans | Watford | Fairfield Park | Walkern | Royston | Potters Bar | Enfield | Barnet | Preston | Charlton | Woolmer Green | Baldock | And many more! Fully insured by Simply Business. Call 07918121792 today for a free quote. Providing our services throughout Hertfordshire. visiting towns like: Stevenage, St.Albans, Welwyn, Letchworth, Hitchin, Hertford, Hatfield, Ware, Biggleswade, Knebworth, Enfield, Potters Bar, Welwyn Garden City & many more. call today for a free quote!